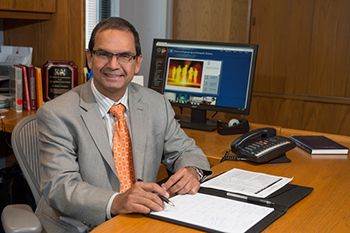 Syracuse University Vice Chancellor and Provost Eric F. Spina today named Chilukuri K. Mohan interim dean-designate of the College of Engineering and Computer Science. A faculty member at the University for more than 25 years, Mohan has served as chair of the Department of Electrical Engineering and Computer Science since 2009. Mohan will assume the role of interim dean on Jan. 1, 2015, succeeding Laura J. Steinberg who, after a semester-long sabbatical, will assume a university-wide leadership role in July 2015. Under Mohan’s leadership there has been significant advancement of the Department of Electrical Engineering and Computer Science. Research expenditures have doubled, the number of National Science Foundation CAREER award winners increased from one to six and numerous new research efforts have been launched. EECS students and faculty have had many accomplishments and won notable awards in recent years. Additionally, Mohan has helped establish new interdisciplinary B.S./M.S. programs, supported the launch of three online M.S. degrees and has worked to strengthen relationships with such strategic partners as JPMorgan Chase and the Air Force Research Lab (AFRL). Through his department’s collaboration with the iSchool, a joint B.S. program in systems and information science was developed. Under Mohan’s leadership, two strong research groups have emerged as focus areas for the college: cybersecurity and intelligent wireless systems. In support of the cybersecurity area the college has launched a certificate of advanced study and M.S. program in cybersecurity and a cyber engineering semester for undergraduates. The intelligent wireless systems group has leveraged its strong relationships with AFRL and researchers at such institutions as Princeton, University of Illinois and MIT. As a researcher, Mohan has made considerable contributions to several topics within the field of artificial intelligence, with current focus in social network dynamics. He has collaborated with University colleagues in multiple other disciplines, and currently applies his expertise to areas that include cybersecurity, bioinformatics and hydrodynamics. He is the co-editor-in-chief of a journal and serves on several conference committees. He has co-authored two books and about 190 papers and articles that have appeared in various journals and conference proceedings; he has also co-edited three books and advised/co-advised 23 Ph.D. students. His pioneering works include the first mathematical analysis of particle swarm optimization and several algorithmic innovations in artificial neural networks and evolutionary algorithms. Most recently, he led a team of six academic institutions in the development of Smart Grid curricula, including the establishment of a state-of-the-art Smart Grid and Power Systems laboratory at Syracuse University, funded by the U.S. Department of Energy. Mohan holds a Ph.D. from the State University of New York at Stony Brook and an undergraduate degree from the Indian Institute of Technology at Kanpur. At Syracuse University, he has developed and taught many courses in computer science, and considers the success of his students to be his greatest accomplishment. He has been an active member on several college and University-wide committees, and served as chair of the Senate budget and fiscal affairs committee from 2008-2010.